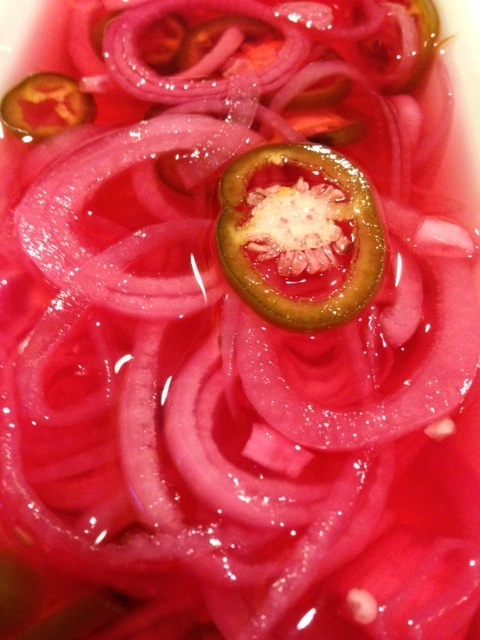 Pickled red onions are great tangy addition into sandwiches, salads, and tacos. I love the beautiful pink hue, it will brighten up any dish you serve! Place sliced jalepeños and onions in a mixing bowl (I take the easy way out and use a mandoline set at 1/4 " for my penos and onions). In a saucepan, heat the vinegar, water, sugar and salt over medium-high heat. Whisk continuously until the sugar is dissolved and than bring to a boil. Pour the mixture over the onions and jalapeños and press down with a spoon until they are submerged in the pickling liquid. I recommend placing a double layer of paper towel on top to help keep the onions and jalapeños submerged. Allow to sit and cool for about 30 minutes. Place the pickled red onions in a sealed container, like a Ball mason jar, in the refrigerator. They are ready to eat and can be stored in an air tight container for quite some time. Yum! I love pickled anything. And jalapenos too! I'll have to try this soon.